New legislation would ensure that parents and guardians have more options to plan for the long-term financial needs of family members with disabilities. 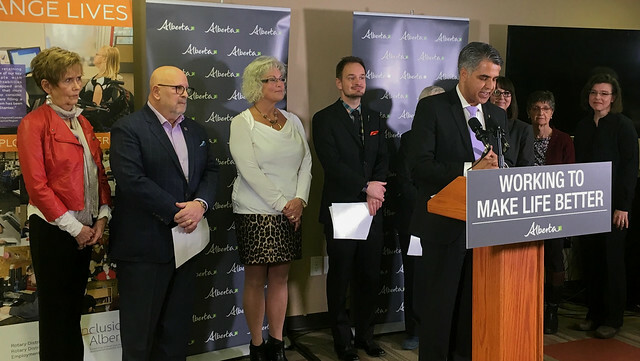 Minister Sabir with families of Albertans with disabilities and advocates speaking to the introduction of Bill 5: Act to Strengthen Financial Security for Persons with Disabilities. If passed, The Act to Strengthen Financial Security for Persons with Disabilities would amend current Assured Income for the Severely Handicapped (AISH) legislation to allow families, guardians and AISH recipients to set up trusts to provide for persons with disabilities without negatively affecting a person’s eligibility for the AISH program. This would allow persons with disabilities eligibility for the living allowance, child benefit and personal benefits under the AISH program, while also allowing families and Albertans with disabilities to plan for their futures. Currently, the asset rules on trusts are unclear and penalize some families looking to provide for their children. Existing policy allows for an exemption of non-discretionary trusts as an asset on a case-by-case basis, but if a person with a disability holds a discretionary trust asset, regardless of whether they are receiving payments from that trust, they are ineligible for AISH. The proposed legislation would open options for Alberta families and provide clarity by exempting both discretionary and non-discretionary trusts as assets when determining eligibility for AISH. Under the proposed legislation, a one-year grace period would come into effect to allow people time to move an inheritance or other lump sum payment into a trust or other exempt asset. This would allow an AISH applicant/recipient or their cohabiting partner adequate time to make financial decisions instead of immediately becoming ineligible for AISH. The AISH program provides a living allowance, health benefits, and supplementary benefits to eligible adult Albertans with a permanent disability. Close to 60,000 Albertans receive AISH benefits. The treatment of trust income is not changing and may affect the level of an AISH client’s monthly living allowance. An applicant’s age, residency, financial and medical situation are considered when determining eligibility for the AISH program. The amount of the monthly living allowance an AISH client receives depends on any other income they or their spouse/partner have.